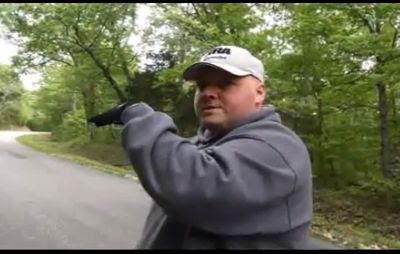 Charlie Raymond of the Kentucky Bigfoot Research Organization (KBRO) brings us another great eyewitness interview. After watching the documentary Sasquatch: Legend Meets Science a year prior, Chuck began researching an area in the Hoosier National Forest. The probability of an encounter does increase if you frequent area of known Sasquatch sightings. This was an emotional experience for Chuck and after great consideration he agreed to document his encounter. During the investigation the Bigfoot was determined only to be about 6-7 foot in height with very broad shoulders. Behind the tree is a steep embankment so it may have been a little further away from the tree or perhaps it was slightly crouching behind the tree? This took place in 2006 a little after midnight. We have had Squatch encounters in the Hoosier National Forest as well.